Born into a family of wealth and privilege during World War II, Mark Erwin’s childhood was less than normal or happy. The son of a free-spirited, socialite mother who was used to getting whatever she desired, he witnessed her decline into depression, alcoholism and despair, which almost destroyed the family. This could be called a story of “riches to rags and back to riches,” with plenty of life lessons between. From this rocky beginning, you will enjoy the curious, even miraculous journey, which has taken Erwin to places and positions never envisioned by even his most faithful admirers. With no financial resources, little education and few prospects, read how he overcame these challenges to achieve success in business, philanthropy, politics, diplomacy and life. Erwin is a truly self-made man. According to him, his greatest achievement is his family. Joan and he have been married forty-four years and have raised two wonderful daughters, who in turn have rewarded them with three beautiful granddaughters. They all reside in Charlotte, North Carolina. 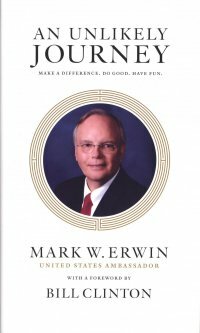 Mark Erwin is an author, businessman, and retired United States Ambassador. Also an investor, sportsman, philanthropist, ordained lay minister, and fair golfer and is the recipient of many honors, including an Honorary Doctorate in Humane Letters, several Honorary Knighthoods and The Order of the Long Leaf Pine, He has served innumerable civic, charitable, cultural and educational organizations. His books include The Practical Ambassador: A Common Sense Guide for United States Ambassador, which is now part of the curriculum of the Foreign Service Institute at the State Department; his memoir An Unlikely Journey, Make a Difference, Do Good and Have Fun, (Forward by Bill Clinton) and Life’s Lessons; Lines of Wisdom from a Faithful Stream as well as Headed Home; Providences of Life, Love and Joy, both of which he co-authored with renowned artist Bob Timberlake.